Inflammation of the airways, which is often associated with life-threatening infection by Gram-negative bacteria or presence of endotoxin in the bioaerosol, is still a major cause of severe airway diseases. Moreover, inhaled endotoxin may play an important role in the development and progression of airway inflammation in asthma. Pathologic changes induced by endotoxin inhalation include bronchospasm, airflow obstruction, recruitment of inflammatory cells, injury of the alveolar epithelium, and disruption of pulmonary capillary integrity leading to protein rich fluid leak in the alveolar space. Mammalian Toll-like receptors (TLRs) are important signalling receptors in innate host defense. Among these receptors, TLR4 plays a critical role in the response to endotoxin. Lungs are a complex compartmentalized organ with separate barriers, namely the alveolar-capillary barrier, the microvascular endothelium, and the alveolar epithelium. An emerging theme in the field of lung immunology is that structural cells (SCs) of the airways such as epithelial cells (ECs), endothelial cells, fibroblasts and other stromal cells produce activating cytokines that determine the quantity and quality of the lung immune response. This review focuses on the role of TLR4 in the innate and adaptive immune functions of the pulmonary SCs. Cytokines that stimulate the innate immune response are not constitutively expressed but must be called into play by specific signals that alert the host to invading micro-organisms. Mammalian Toll-like receptors (TLRs) are similar in structure and function to the Drosophila Toll protein . The cytoplasmic domain of this transmembrane protein is similar to that of the mammalian IL-1 receptor, suggesting that both Toll and mammalian TLRs share similar signal-transduction pathways via a MyD88-dependent pathway that ultimately involves the NF-κB family of transcriptional factors. NF-κB serves as a master switch, transactivating various cytokines that are involved in the innate and transition to adaptive immunity . Medzhitov and colleagues were the first to characterize a human TLR, TLR4 . The constitutively active mutant of TLR4, when transfected into human cell lines, activates NF-κB and stimulates the expression of the proinflammatory cytokines IL-1, -6, and -8. In addition, TLR4 signal transduction and NF-κB transactivation induces expression of IL-12p40, as well as CD80 and CD86, costimulatory molecules that link innate and adaptive immune responses by activating antigen-specific responses by naive T cells. The response to lipopolysaccharide (LPS), a cell wall component of Gram-negative bacteria, is initiated upon its interaction with TLR4 in conjunction with the accessory molecules MD-2 and soluble or membrane-bound CD14 . The response is then transduced via the interleukin (IL)-1 receptor signalling complex, which includes two essential adaptor proteins, myeloid differentiation (MyD)88 and tumor necrosis factor receptor-associated factor (TRAF)6 as well as the serine-threonine kinase known as IL-1R-associated kinase (IRAK). Other components involved in this signalling pathway include mitogen-activated protein kinases (MAPKs) such as extracellular signal-regulated kinase 1/2 (ERK1/2), c-Jun N-terminal kinase (Jnk), and p38 kinase (p38) [5, 6]. This signal transduction pathway further coordinates the induction of multiple genes encoding inflammatory mediators and co-stimulatory molecules . A detailed description of the TLR signalling has been reviewed recently . Noulin et al  analyzed the role of TLR signalling and the contribution of different cell types in response to aerogenic LPS. They focused on the role of the common TLR and IL-1R adaptor molecule, the MyD88. Absence of MyD88 confers resistance to systemic endotoxin-induced shock , although there is evidence that LPS can use MyD88-independent signalling pathways . In particular, other adaptor proteins such as TIR domain-containing adaptor inducing IFN-β (TRIF)3 [12, 13] and TRIF-related adaptor molecule (TRAM) [14, 15] have been implicated in some responses to LPS resulting in IFN type I-dependent expression of costimulatory molecules. TRAM is thought to act as a link between TRIF and TLR4, like Toll/IL-1R domain-containing adaptor protein (TIRAP) bridging MyD88 to TLR4. MyD88 and TIRAP are involved in early activation of NF-κB and MAPK [16–19], whereas TRIF and TRAM are critical for late activation of NF-κB as well as the activation of IRF-3 [15, 20]. 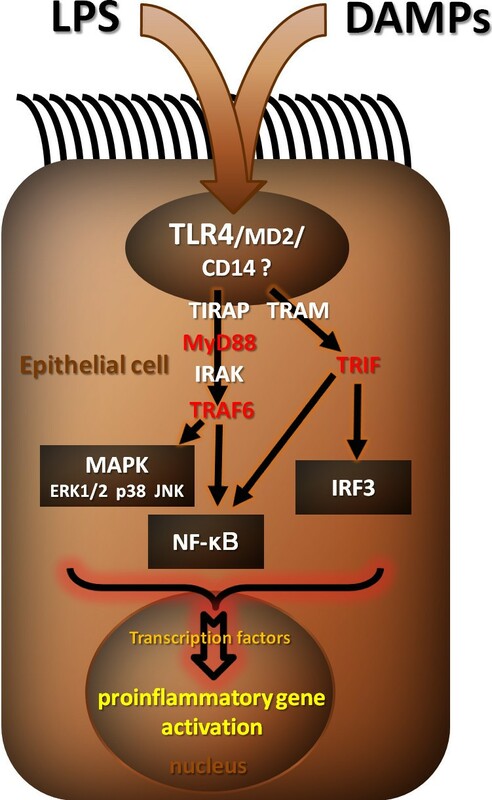 A recent work on macrophages/dendritic cells (DC) suggests that no pathway other than MyD88-dependent or TRIF-dependent pathways exists in response to LPS in TLR4-mediated signalling , whereas a third pathway independent of TLR4 possibly exists . Noulin et al demonstrated that MyD88 is indeed essential for the LPS-induced acute pulmonary inflammation response, whereas TRIF is dispensable. Accordingly, Guillot et al  showed that ECs response to LPS involves at least the signal-transducing molecules MyD88, IRAK, and TRAF6 and activation of the transcription factor NF-κB. Also MAPKs appear to be important mediators of this cell activation process as three of these kinases (p38, Jnk, and ERK1/2) are selectively activated in a time-dependent manner by LPS (Figure 1). TLR4 signalling. Of all the radioresistant stromal cells (SCs), epithelial cells (ECs) that line the airways are the most likely to mediate the effects of LPS, given their exposed position, their known and confirmed expression of TLR4 and their activation of TLR4 dependent signalling cascades upon exposure to TLR4 ligands (LPS, DAMPs, HDM). The intracellular compartmentalization of TLR4 may prevent "inopportune" activation of pulmonary ECs. Whereas TRL4 signalling via MyD88 is essential for the LPS-induced acute pulmonary inflammation response, TRL4 signalling via TRIF is dispensable . MyD88 and TIRAP are involved in early activation of NF-κB and MAPK, whereas TRIF and TRAM are critical for late activation of NF-κB as well as the activation of IRF-3 . There is no consensus about the expression and role of CD14 in LPS-induced lung epithelial activation. Various studies have provided evidence that TLR4 plays a critical role in myeloid cells [24–26], but recent reports suggest that a LPS signalling system also exists in cells of epithelial origin. TLR4 is expressed in intestinal [27, 28], renal , colonic, and gingival epithelia . In the lung, TLR4 expression has been demonstrated in alveolar and bronchial epithelial and vascular endothelial cells [23, 31, 32]. Sha et al demonstrated that ECs express mRNA for all TLR and that several known TLR ligands activate epithelial cells to express chemokines, cytokines, and host defense molecules, including acute phase proteins and complement proteins. Moreover the expression of these receptors may be increased by cell activation. Among the induced genes were macrophage inflammatory protein (MIP)-3α and granulocyte macrophage-colony-stimulating factor (GM-CSF), which would be expected to recruit and activate immature DCs that might be important in early triggering of adaptive immune responses. Guillot et al  demonstrated by reverse transcription-PCR and/or immunoblot that TLR4 and the accessory molecule MD-2 are constitutively expressed in distinct human alveolar and bronchial ECs. Based on flow cytometry experiments, they showed that is unlikely that LPS might recruit TLR4 to the cell surface upon cell activation. However, it can not be excluded that inflammatory mediators such as cytokines or bioactive lipids might be able to induce TLR4 relocalization. Intracellular compartmentalization of TLR4 allowed nevertheless LPS to strongly induce the secretion of proinflammatory mediators. Epithelial activation by LPS does not alter TLR4 expression at the mRNA or protein level or alter its intracellular localization. In agreement with the absence of TLR4 expression on the cell surface of pulmonary ECs, it was also relevant to notice that addition of a blocking anti-TLR4 antibody in the extracellular medium had no effect on activation by LPS as assessed by the measurement of IL-8 secretion. One can speculate that the intracellular compartmentalization of TLR4 may prevent "inopportune" activation of pulmonary ECs due to a regular exposure to air containing trace amounts of LPS and as a consequence a chronic inflammatory state (Figure 1). In the context of this distinctive cell distribution, TLR4 signalling may therefore be triggered only upon exposure to a high amount of free or bacteria-associated LPS as occurs in occupational or infectious diseases [33, 34]. Subsequently the pulmonary epithelium may then participate in the local innate response through the secretion of cytokines and antimicrobial peptides. Interestingly, before the identification of TLR4 as an essential participant in LPS signalling, Wright and colleagues  showed that LPS is rapidly delivered from the plasma membrane to an intracellular site and that agents that block vesicular transport alter cell responses to LPS. Moreover Vasselon et al. demonstrated that monomeric LPS crosses the cell membrane and traffics within the cytoplasm independently of membrane CD14, while aggregates of LPS are internalized in association with CD14. However, Guillot et al  failed to detect CD14 protein expression in human primary polarized bronchial ECs using confocal microscopy, and no CD14 protein staining could be detected in lung epithelial samples. A similar result was observed using the pulmonary EC line A549 but was not seen with BEAS-2B cells, which express a low level of CD14. Thus, these data do not currently dissipate the debate that exists concerning the expression and role of CD14 in LPS-induced lung epithelial activation. Several authors proposed that these cells are CD14-negative [37, 38], while others demonstrated both CD14 mRNA and cell surface protein in human airway ECs [33, 39, 40]. In fact, these contradictory results may be explained by distinct basal activation or differentiation state of the ECs used throughout these investigations. Expression of TLR4 in non-BM cells appears to be essential for neutrophil recruitment to the lungs following systemic LPS administration . Andonegui et al. , showed that TLR4-deficient neutrophils were sequestered in capillaries of mice expressing TLR4 in non-BM cells within 4 h of intraperitoneal injection of LPS, and the authors speculated that TLR4 expression in the endothelium was required for this recruitment. As depicted above, LPS signalling through TLR4 in pulmonary ECs involves at least the signal-transducing molecules MyD88, IRAK, and TRAF6 and activation of the transcription factor NF-κB . Noulin et al. showed that inhaled endotoxin-induced acute bronchoconstriction, TNF, IL-12p40, and KC production, protein leak, and neutrophil recruitment in the lung are abrogated in mice deficient for the adaptor molecule MyD88. MyD88 is involved in TLR, but also in IRAK-1-mediated IL-1R and -18R signalling. A role for IL-1 and IL-18 pathways in this response was excluded, as bronchoconstriction, inflammation, and protein leak were normal in IL-1R1 and caspase-1 (ICE)-deficient mice. Furthermore, using bone marrow chimera, it was shown that non-bone-marrow (BM)-derived radioresistant resident cells, probably ECs, were involved in sensing LPS to mediate the bronchoconstriction response, whereas the secretion of TNF and IL-12p40 in alveolar space was dependent on bone marrow-derived cells. To determine the role of respiratory ECs in the inflammatory response to inhaled endotoxin, Skerrett et al. selectively inhibited NF-κB activation in the respiratory epithelium using a mutant IκB-α construct that functioned as a dominant negative inhibitor of NF-κB translocation (dnIκB-α). They developed two lines of transgenic mice in which expression of dnIκB-α was targeted to the distal airway epithelium using the human surfactant apoprotein C promoter. Transgene expression was localized to the epithelium of the terminal bronchioles and alveoli. After inhalation of LPS, nuclear translocation of NF-κB was evident in bronchiolar epithelium of nontransgenic but not of transgenic mice. This defect was associated with impaired neutrophilic lung inflammation 4 h after LPS challenge and diminished levels of TNF-α, IL-1β, macrophage inflammatory protein-2, and KC in lung homogenates. Expression of TNF-α within bronchiolar ECs and of VCAM-1 within peribronchiolar endothelial cells was reduced in transgenic animals. Thus targeted inhibition of NF-κB activation in distal airway ECs impaired the inflammatory response to inhaled LPS. Furthermore, Poynter et al. reported that targeted expression of a dominant negative IκB-α in proximal airway ECs under the control of the rat CC10 promoter exhibited impaired airway inflammation in association with reduced levels of MIP-2 and TNF-α in BAL fluid after nasal challenge with LPS. The results of Skerrett et al. and those of Poynter et al. suggest that NF-κB activation in respiratory ECs contributes to the lung inflammatory response to inhaled LPS through the induction of proinflammatory cytokines, which in turn act to upregulate the expression of adhesion molecules on the vascular endothelium. Accordingly, we recently showed, using TLR4 chimeric mice , that the expression of TLR4 on SCs was crucial to recruit neutrophils and monocytes in response to LPS. This effect was likely to be mediated by several chemokines and by growth factors for neutrophils (KC, granulocyte colony-stimulating factor (G-CSF)), monocytes and DCs (C-C chemokine ligand-2 (CCL2), and CCL20). More than 70% of DCs recruited to the airways in response to LPS were inflammatory DCs as they expressed high levels of CD11b. These inflammatory DCs have been shown to derive from Ly6Chi blood monocytes, and to be recruited by the chemokine CCL2 under inflammatory conditions. Interestingly, we have observed an upregulation of CCL2 in the airways following LPS and house dust mite (HDM) administration [44, 45]. The LPS- and the HDM-induced recruitment of inflammatory cells to the airways was abolished when SCs did not express TLR4  (Figure 2). This result obtained with HDM was somewhat unexpected as, until very recently, it was unknown whether relevant environmental allergens such as HDM would be able to trigger TLRs. Phipps et al convincingly reported that the effects induced by HDM were reduced in MyD88-/- and TLR4-/- mice . Using dynamic imaging of freshly explanted tracheal samples, we observed that LPS and HDM inhalation induced a rapid scanning behavior of tracheal MHCIIhigh DCs that depended on TLR4 expression by SCs. Such a scanning behaviour is typical of activated DCs and helps them to probe the mucosa for incoming antigens. Moreover, in response to LPS or HDM, TLR4+ SCs produced DC-activating cytokines such as GM-CSF in the airways. This cytokine is likely to be involved in airway DC maturation, leading to their subsequent migration to the mediastinal lymph nodes, a process necessary for the activation of naïve T cells and the initiation of immune responses. This necessity of TLR4 expression in the initiation of Th2 responses in the airways was recently confirmed by Tan et al. in a similar chimeric mouse model . It is important to note that the expression of TLRs by stromal cells is crucial in the control of immune response to a wide variety of antigens. Indeed, using MyD88 chimeric mice, Hajar et al. observed an important role of MyD88 in the early recruitment of inflammatory cells and in the control of bacterial infection . Consequences of TLR4 activation on pulmonary SCs. TLR4 signalling on SCs is required for early chemokine production and neutrophil and DC recruitment to the lungs, and direct bonchoconstriction, whereas robust cytokine production (IL-1, IL-6, IL-12p40, TNFα, etc.) is dependent of BM-derived cells. Moreover, the TLR4 signalling on pulmonary ECs induces a Th2 polarizing response, via the induction of Th2-inducing DCs. In addition to their involvement in innate immune responses, the airway epithelium is also capable of driving the exacerbation of established allergic airway diseases by the production of pro-Th2 cytokines and chemokines such as IL-4, IL-13, TSLP, and TARC/CCL17 [49, 50]. DCs, which densely line the airways, are critically involved in the pathogenesis of allergic diseases and are known to be potent inducers of CD4 T cell differentiation, expansion, and polarization [51, 52]. However, the mechanism by which immature pulmonary DCs undergo maturation and become effector T cell-inducing antigen presenting cells (APCs) is unclear. Using bone marrow chimeric mice to restrict TLR4 signalling to either the SC compartment (SC+HPC-) or the hematopoietic cell (HPC) compartment (SC-HPC+), we showed that TLR4 expression on lung radioresistant SCs, but not on DCs, is necessary and sufficient for DC activation in the lung and for priming of Th2 responses to HDM . TLR4 triggering on SCs induced the activation of airway WT DCs as read out by CD86 and CD40 expression . Moreover, in a WT animal exposed to LPS, DCs that had migrated to the draining lymph nodes were able to induce effector T cell responses characterized by the production of IL-17A and IFN-g. It was however intriguing to see that in chimeric mice lacking TLR4 expression on stromal cells, WT DCs in the airways were no longer able to induce affector T cell differentiation. The same held true when HDM was used instead of LPS. It is therefore very likely that TLR4-expressing stromal cells release factors that instruct airway DCs to induce a particular type of immune response. Such factors might include cytokines such as GM-CSF, known to induce DC activation , or other cytokines such as TSLP or IL-33 which might contribute to set the stage for Th2 response development [55, 56]. In agreement with this, the absence of TLR4 on structural cells, but not on hematopoietic cells, prevented the development of HDM-driven allergic airway inflammation and the production of Th2 cytokines by mediastinal lymph node T cells. Interestingly, in the same mice, the levels of instructing cytokines were severely impaired. Interestingly, inhalation of a TLR4 antagonist to target ECs suppressed the salient features of asthma, including bronchial hyperreactivity. In a similar way, Th2 sensitization to inhaled ovalbumin (OVA), an antigen often used to induce asthma features in mice but often criticized for its content in LPS, seems to depend on recognition by stromal TLR4. When it comes to LPS, it is generally approved that the concentration of LPS determined the type of immune response induced, with high concentrations (LPShigh) inducing Th1 responses and low concentrations (LPSlow) inducing Th2 responses [57, 58]. A recent study reported that using contaminated OVA contaminated with high levels of LPS, the stromal recognition of LPS by TLR4 led to a robust Th2 response, indicating that in the presence of higher concentrations of LPS, stromal cell expression of TLR4 is sufficient for Th2 sensitization . In view of these results, one can wonder about the level of contamination of allergen preparation such as HDM extracts. When addressing this issue in our experiments showing a crucial role for stromal TLR4 expression in Th2 responses to HDM , we found that the degree of endotoxin contamination of HDM extract was in the subnanogram range, far below the dose previously reported to promote TH2 responses to OVA . If HDM extracts contain such a low level of LPS contamination, why are they triggering TLR4? A very elegant study by Trompette et al. showed that Der p 2, one major allergen of the house dust mite Dermatophagoides pteronyssinus, was found to enhance the response of mouse bronchial ECs to endotoxin by acting as an MD2-like chaperone that promotes TLR4 signalling , providing an explanation to the profound proallergic innate response to HDM. Altogether, these studies demonstrate that stromal cell TLR4 signalling is critically involved in Th2 but not Th1 sensitization to inhaled allergen . Stromal TLR4 signalling leads to the maturation of Th2-inducing DCs that fail to produce proinflammatory cytokines or to upregulate the Th1-inducing Notch ligand Delta-4. Following intranasal administration of LPS or HDM into the airways, stromal cells upregulate mRNA expression or synthesis of TSLP, suggesting a stromal cell-dependent instruction of DCs in the priming of allergic Th2 responses (Figure 2). The TLRs have well-established roles as pattern recognition receptors in acute infection [1, 11]. More recent work has focused on the observation that the inflammatory response after trauma, hemorrhage, and ischemia-reperfusion injury has many similar features as that after acute infection [60, 61]. Recently, Baudoin  reviewed these findings. For example, mice with TLR-4 mutations are resistant to both lipopolysaccharide and have an increased survival after experimental hemorrhagic shock . Better survival has also been reported in experimental orthopaedic trauma and ischemia-reperfusion injury to the heart and lungs . Experiments using TLR4 chimeric mice indicate that expression of functioning TLR on both marrow derived, immune cells and parenchymal tissue is necessary for noninfectious injury to occur . Despite early suggestions that endotoxin mediate noninfectious tissue injury, it is now clear that TLR-4 can be activated by several ligands that are not derived from microbes  (Figure 2). These include high mobility group box 1 (HMGB1), a DNA-binding protein with proinflammatory properties, heparan sulfate, low-molecular-weight hyaluronan, fibrinogen, and heat shock proteins (HSPs). All these endogenous molecules are produced by or released from cells that are either severely stressed or dying and are called damage associated molecular pattern molecules (DAMPs). The release and sensing of these molecules would provide a mechanism for innate immune activation that is both independent and complementary to that produced by microbes alone. This is likely to amplify the immune response to infection in any body area where significant tissue injury occurs. However, in some situations, the innate immune response, which evolved to limit the spread of infection, could become damaging. Ventilator-associated lung injury may be an example of such a situation . Animals ventilated with elevated tidal volumes develop an acute lung injury that is characterized by the appearance within the lungs of acute inflammatory cells and the local production of proinflammatory mediators . This may be caused by ventilator-induced activation of the innate immune system by the TLR-4 receptor. In a series of experiments with wild and TLR4-deficient mice, Hu et al showed that the acute lung injury, induced by ventilation, is reduced in animals that lack the Toll-like 4 receptor . In the deficient animals, neutrophil accumulation was reduced as was the lung expression of TLR protein. In addition, in isolated lung preparations, they demonstrated that TLR-4 expression on both acute inflammatory cells and lung parenchymal cells was necessary for lung injury to develop. The results support and extend another recent publication on the effect of mechanical ventilation in TLR-4-deficient mice. In that study, TLR-4 knockouts were protected against the proinflammatory actions of mechanical ventilation . However TLRs may also protect against acute lung injury in other situations. TLR2-/-TLR4-/- dual knockout mice were more sensitive to both bleomycin and hyperoxia-induced acute lung injury and had increased mortality compared with wild-type controls . TLR4 signalling on SCs contributes to the lung inflammatory response to inhaled LPS through the induction of proinflammatory cytokines/chemokines, which in turn act to upregulate the expression of adhesion molecules on the vascular endothelium. TLR4 signalling on SCs is required for early chemokine production and neutrophil recruitment to the lungs, and direct bonchoconstriction. Moreover, the TLR4 signalling on pulmonary ECs induces a Th2 response by instructing airway DCs. 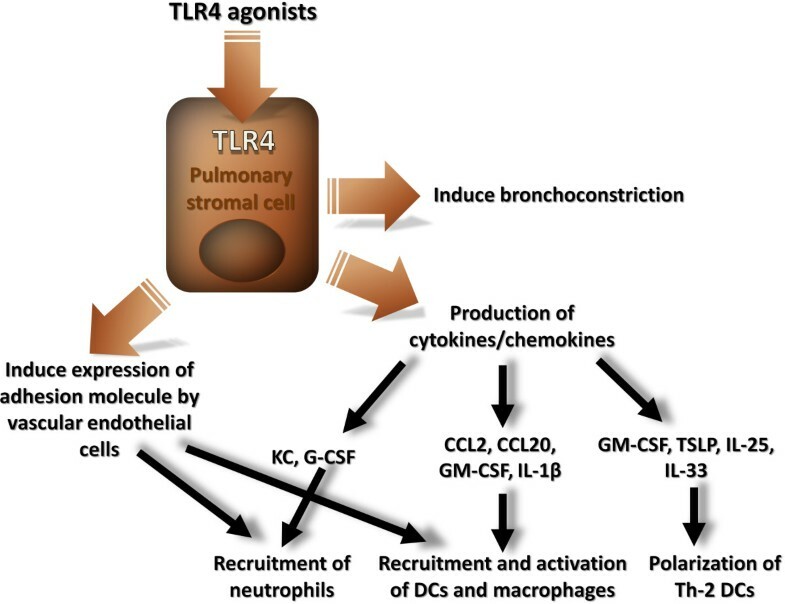 The data reported in this review support the idea that a therapeutic strategy blocking TLR4 receptors might be effective in some forms of infectious and non infectious human lung diseases. FP has published in the fields of asthma, pulmonary hypertension and pulmonary inflammation. His research is mainly focused on the role of immunological pathomechanisms in the pulmonary vascular remodeling. BL and HH are the authors of over 100 papers dealing with the use of mouse models to study the pathogenesis of asthma and cancer related immunosuppression. The interest of their research group is on the role of antigen presenting dendritic cells in the initiation of the pulmonary immune response that ultimately leads to sensitization to antigens, applied to allergic disease, respiratory viruses and cancer immunotherapy. TIR domain-containing adaptor inducing IFN-β. FP was supported by a long-term Fellowship grant from the European Respiratory Society, ERS fellowship number LTRF 171, and then by the Fondation pour la Recherche Médicale (FRM), grant number DEQ20100318257. BL is supported by an Odysseus Grant from the Flemish Government (FWO). FP, BL and HH contributed to drafting and revising the manuscript. All authors read and approved the final manuscript.